Ben & Jerry. They’re the two men every woman can always count on. 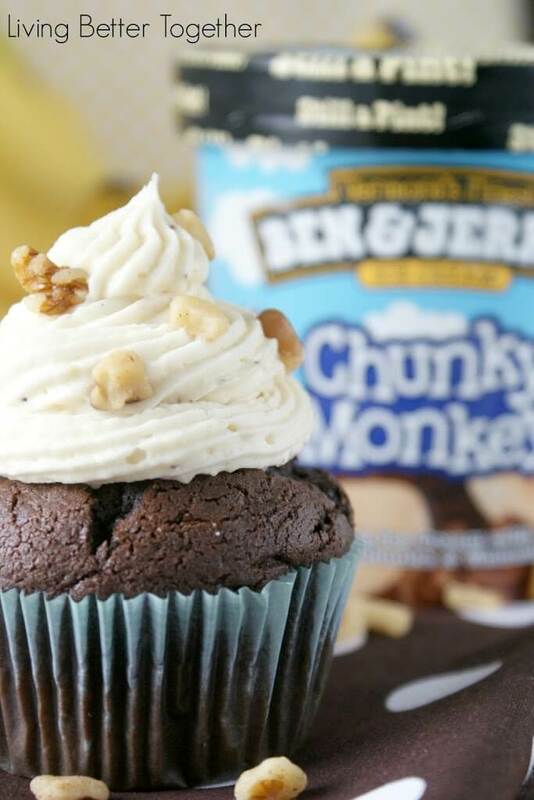 We all have our favorite flavor, for me, it’s Chunky Monkey! For those who may not be familiar with it, it’s a creamy banana ice cream with walnuts and chocolate chunks. Hey, that’s almost like getting a serving of fruit and protein, right? Do you think that makes it acceptable for breakfast? 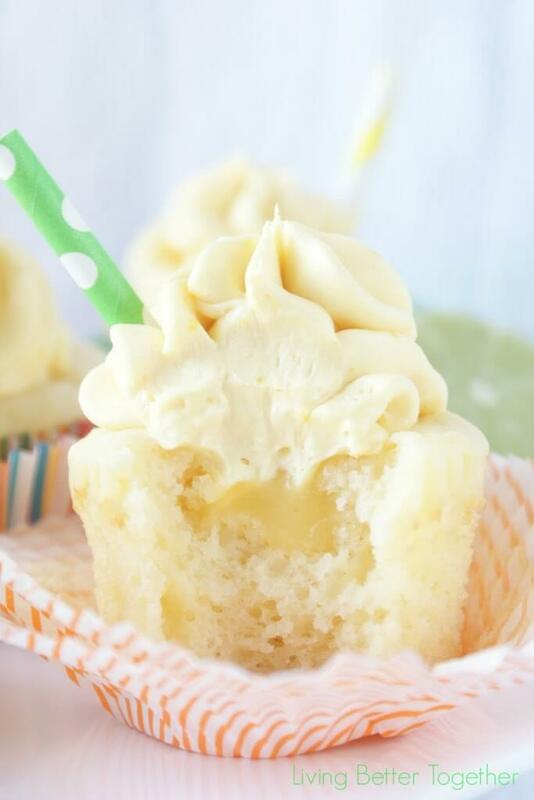 So what do you do with your favorite ice cream, make a cupcake version of course! 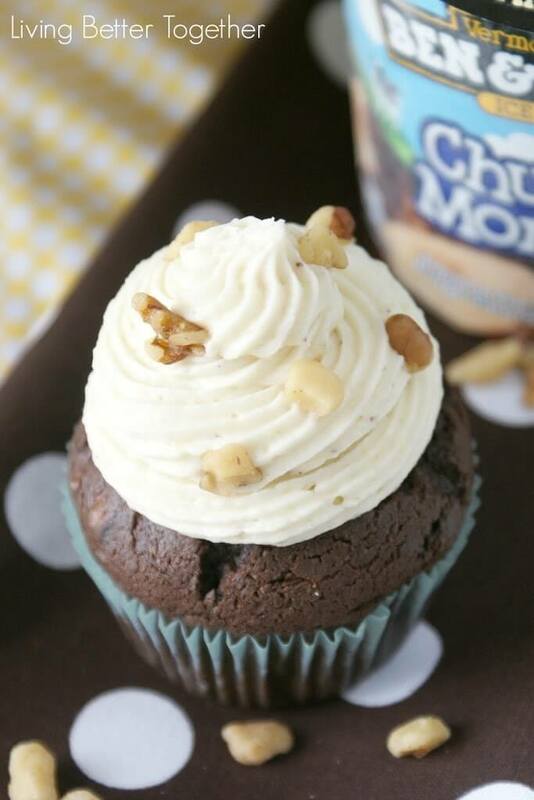 These fluffy chocolate cupcakes are filled with crunchy walnuts and topped with a creamy banana buttercream. These are perfect for a girl’s night with some good chick flicks, make them even better by throwing them in a bowl with a scoop of chunky monkey, oh, you know you want to! 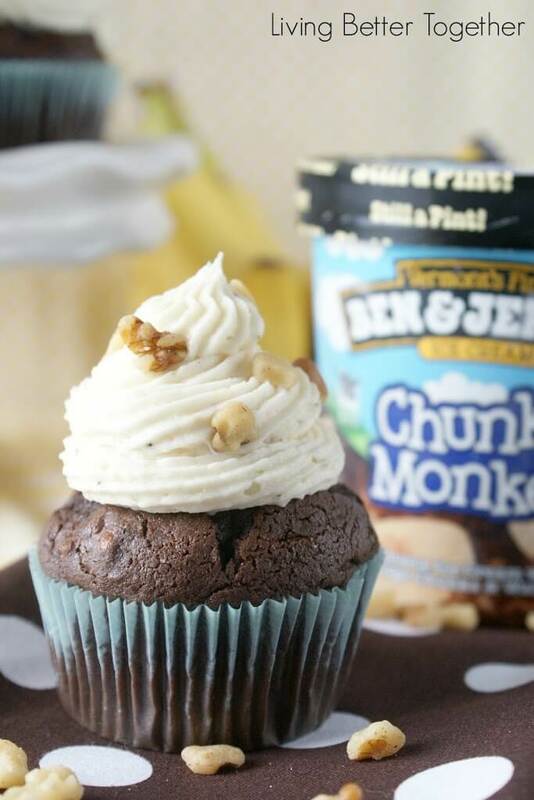 These Chunky Monkey Cupcakes are inspired by the famous Ben & Jerry's ice Cream! 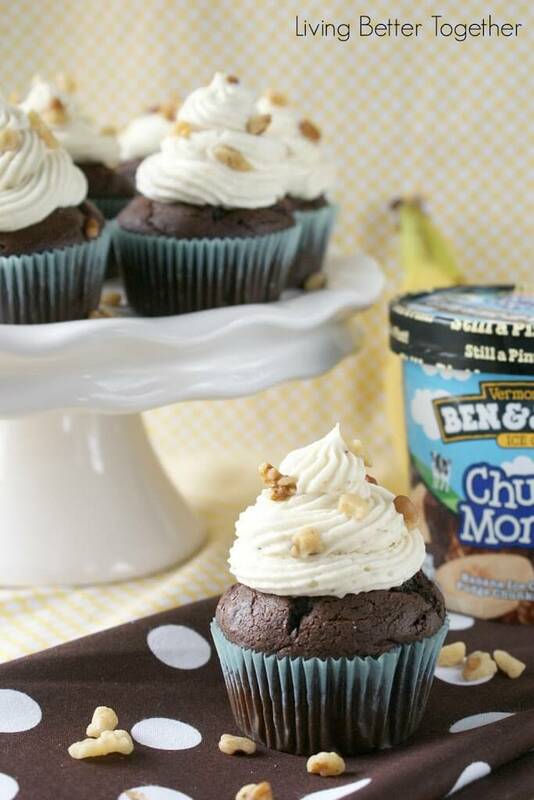 Chocolate, bananas and walnuts combine for an amazing sweet treat! Combine all ingredients (except walnuts) in a stand mixer and beat until combined. Fill cupcake liners 1/2 - 2/3 full. Reduce heat to 375 F.
Bake for 15-18 minutes until toothpick comes clean. Add freeze dried banana slices to a food processor and blend until you have a fine dust. Slowly add banana and confectioners' sugar and beat until fluffy. Add heavy cream a tbsp at a time if needed to reach desired consistency. 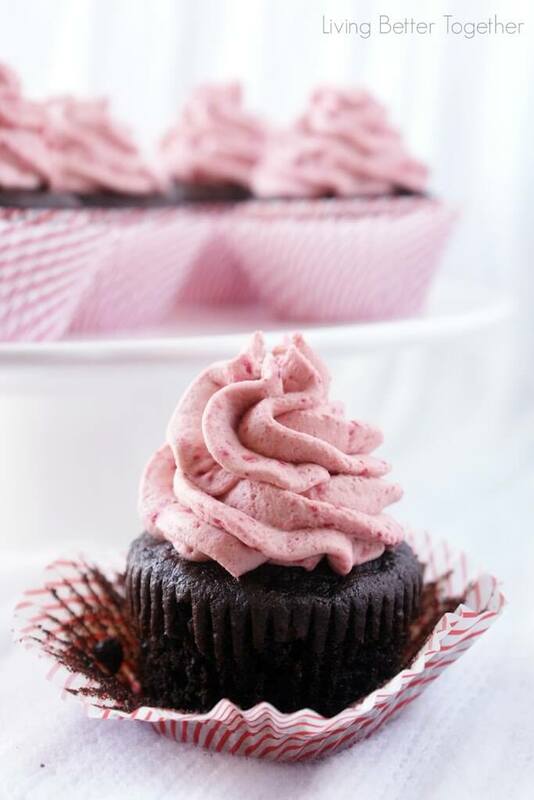 Use a bag or decorator tool to pipe frosting onto cooled cupcakes. 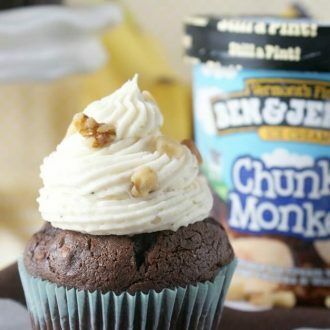 I know these Chunky Monkey cupcakes will be good because I make a Chunky Monkey crumb cake and Everbody loves it! Oh Linda, that sounds delicious! I’m making chunky monkey cookies this weekend!